The Phoenix lander will not be phoning home. A new image of Phoenix taken this month by the HiRISE camera (High Resolution Imaging Science Experiment) on board the Mars Reconnaissance Orbiter shows signs of severe ice damage to the lander’s solar panels, with one panel appearing to be completely gone. The Phoenix team says this is consistent with predictions of how Phoenix could be damaged by harsh winter conditions. It was anticipated that the weight of a carbon-dioxide ice buildup could bend or break the solar panels. Mellon calculated hundreds of pounds of ice probably coated the lander in mid-winter. Several attempts to contact Phoenix during the past few months came up empty. See the larger image of all the various pieces of Phoenix on the HiRISE website. So now, the Phoenix mission is officially over. 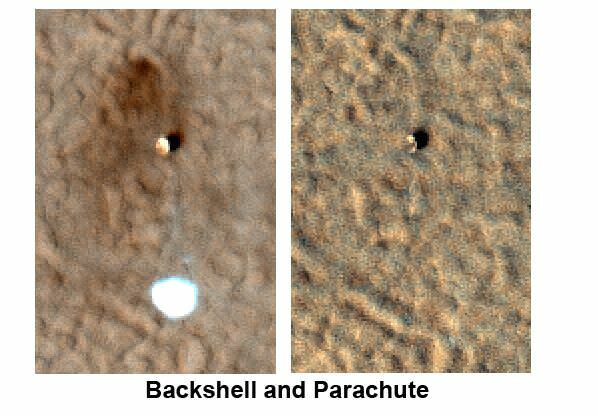 But during its mission on Mars, Phoenix confirmed and examined patches of the widespread deposits of underground water ice detected by Odyssey and identified a mineral called calcium carbonate that suggested occasional presence of thawed water. The lander also found soil chemistry with significant implications for life and observed falling snow. The mission’s biggest surprise was the discovery of perchlorate, an oxidizing chemical on Earth that is food for some microbes and potentially toxic for others. For more info and a look back at Phoenix, check out the Phoenix mission website. P.S. Who ate the parachute? The solar panel broke off, or got buried in the dust. Figures that ice, not heat, can do a Phoenix in. Rest in pieces, you earned it. Who ate the parachute? Dust. But if bacteria can brave oxygen surely they can handle a puny oxidizer like perchlorate. Phoenix is no more. This is about what I suspected would be its fate. I suppose after a few winters it will be reduced to pieces. Perchlorates are toxic, and used in some rocket fuel oxidizers. It is nasty stuff. In fact martian soil is largely bad news for anything on Earth besides some chemical extremophyles. These discoveries have put further nails in the coffin for ideas of terriforming Mars or living there. Perchlorates are toxic, […] In fact martian soil is largely bad news for anything on Earth besides some chemical extremophyles [sic]. It is exactly that conflation of toxicities that I’m worried about. Perchlorates aren’t specifically toxic for bacteria, and are used for food for others, see the article. The amount of perchlorates observed hasn’t been verified to be toxic for cells AFAIK. Specifically under Mars conditions where they remain stable, not rocket fuel conditions. But we know that a much stronger and more toxic oxidizer, oxygen, is not a problem for bacteria (and other life) in concentrations and activities far beyond those seen on Mars. Would we then be concluding that this “is largely bad news for anything on Earth”? Yes, it was once, but remaining life adapted. As for the water activity of the soils, I once tried to compare with papers on comparable saline seas and soils here. Turned out that the upper range of Mars water activity is well in the comfort zone not only for extremophiles but for common enough mesophiles. The moderate pH (pH 7 – 8, IIRC) was certainly tolerable for most cells. Seems guppies and many plants prefer that range, in fact. So much for “bad news”. Fact seems to be the possibility for life on Mars went up, not down, with the Phoenix finds of water, a decent water activity and a known metabolic energy source besides the known carbon dioxide food source. Other predictions seems to have failed current available tests. These discoveries have put further nails in the coffin for ideas of terriforming [sic] Mars or living there. Assuming the local found perchlorates are planet wide distributed, yes. And perchlorates/water activity would not be a hinder to terraforming anyway as seen from the above, just for immediate living. She was always going to be dead. The damn MERs have just got us so used to a constant stream of miracles from the red planet that we have almost come to expect them these days! Would have been interesting to see the exact moment that it all went pear shaped for it. Man I wish there was someway of having a little camera on there that could endure into winter to have seen the build-up of ice and whatnot, and send it’s faint signal out to be picked up and relayed by MRO or something. The missing parachute is most interesting. Was it buried in the dust? I’m also curious about the (its not ice! )ice pack this thing was buried under. Must have been thick enough to snap the panels but still leave the lander. Seeing that we aren’t seeing the missing panel either, likely yes, wouldn’t you say? There is bacteria in our own oceans which thrive in areas once considered too toxic for life. There is all sorts of toxic crap being thrust up from the Earth yet life thrives in it. TL brings up a good point… if the toxin would tend to work on a nervous system, if there isn’t a nervous system to work on… there isn’t going to be a problem. It’s also amazing what life can adapt to on its own. Am curious about what the parachute was made from? It seems reasonable to assume that the nylon or dacron that was used to make the parachute melted away in contact with perchlorate? 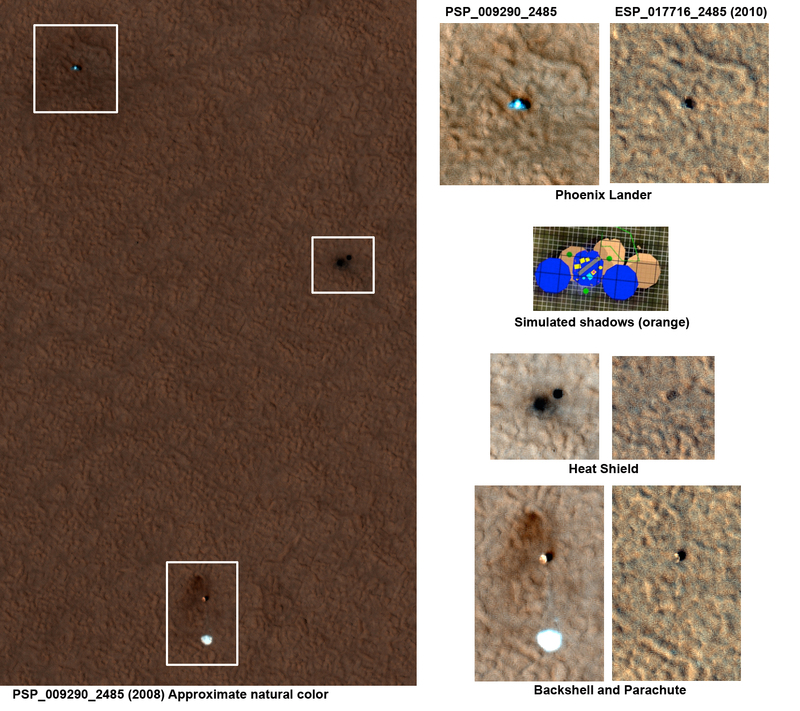 TL, a pile of dust blown to one side of the lander can also hide the shadow since the pile has the same colour of the background. Perchlorates are a source for some bacteria on Earth, and clearly if there exist martian bacteria they have evolved in this region for perchlorates. However, these are very specialized micro-organisms and evolved for these chemical conditions. Most complex Earth life would not survive. The idea of throwing up an air pressure domes and growing food is unlikely. Other regions of Mars appear to be extremely alkaline and toxic for most Earth life as well.